The summer production of “The Addams Family, A New Musical”, has been moved to the spring schedule, replacing “The Neverending Story”. With the additional financial backing from SAMA Healthcare being added to Southern Bancorp and Teague Auto Group’s sponsorship, SAAC is now able to produce a large project like “The Addams Family” in the spring. This makes way for another fantastic musical production this summer. Beth James Burns, executive director at South Arkansas Arts Center, is absolutely giddy about the upcoming announcement concerning the SAAC’s summer musical. 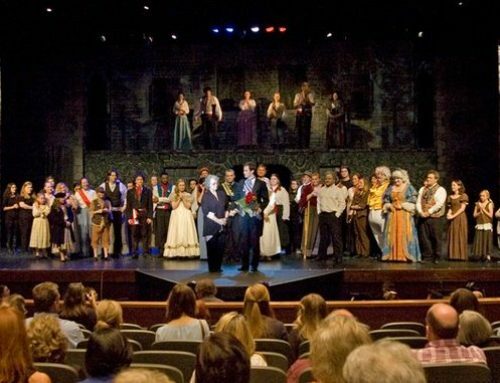 The show that has been selected for the summer is a musical that the SAAC staff has wanted to do for years, and it looks like the dream will finally be coming true. Announcement will be forthcoming as soon as everything involved is finalized. “I’m not at liberty at this time to make an announcement as to the summer musical, but rest assured that the summer musical at the SAAC will be a family ‘must do’”, said Burns. “Having two big musicals in one year is unusual and quite an undertaking for SAAC, but ‘The Addams Family’ is too great a show to drop from the schedule,” according to Burns. “The Addams Family” has been reported to be the “most highly performed musical for the year in community theater.” The story line is hilarious and the songs a bit cheeky, and humorous. Overall, the show “is creepy and it’s kooky, mysterious and ooky”! Auditions will be held for “The Addams Family” on February 3 and 4 in SAAC’s Callaway Theater, with the musical running March 3-5 and 9-11. “The Addams Family” is a musical comedy with music and lyrics by Andrew Lippa and a book by Marshall Brickman and Rick Elice. The show is based upon “The Addams Family” characters created by Charles Addams in his single-panel gag cartoons, which depict a ghoulish American family with an affinity for all things macabre. Numerous film and television adaptations of Addams’ cartoons exist, but the musical, which is the first stage show based on the characters, is based upon the cartoons rather than the television and film characters. The show opened on Broadway in April 2010. The original cast featured Nathan Lane as Gomez and Bebe Neuwirth as Morticia. “The Addams Family” features an original story, and it’s every father’s nightmare. Wednesday Addams, the ultimate princess of darkness, has grown up and fallen in love with a sweet, smart young man from a respectable family – a man her parents have never met. And if that weren’t upsetting enough, Wednesday confides in her father and begs him not to tell her mother. Now, Gomez Addams must do something he’s never done before – keep a secret from his beloved wife, Morticia. Everything will change for the whole family on the fateful night they host a dinner for Wednesday’s ‘normal’ boyfriend and his parents.